New exhibition: "Body of Work: Midcentury Burlesque Through the Lens of F. Roy Kemp"
Congratulations to our 2019 Living Legend Award Recipient, CAMILLE 2000! Congratulations to our 2019 Sparkly Devil Memorial Scholarship recipient: Precious Ephemera! Lineups for the 2019 BHoF Weekender are now live! The Burlesque Hall of Fame is a 501(c)(3) nonprofit museum with a mission to preserve, celebrate, and inspire the art of burlesque. Support BHoF's preservation and educational efforts by becoming a member or donating today! 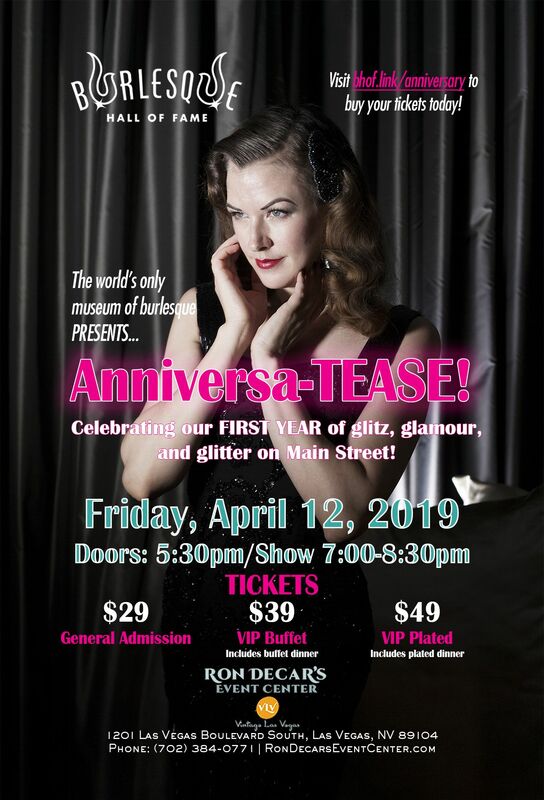 April 17 marks the first anniversary of our new space on Main Street, and we’re celebrating the only way we know how — with a burlesque show! Join us April 12 at Ron Decar’s Event Center at 1201 Las Vegas Boulevard South, Las Vegas, NV 89104. Tickets are $49 VIP Plated / $39 VIP / $29 General Admission (VIP prices include buffet or plated dinner). Doors open at 5:30pm, show starts at 7pm. For more information and to purchase tickets, visit bhof.link/anniversary. Lovey Goldmine: Lovey Goldmine started singing with The Scatman Carothers Trio at the age of 17, before entering burlesque at 21. In 1970, she traveled to Paris where she became a performer at the world-famous Crazy Horse Saloon. Returning to the US, she became a featured performer in Los Angeles clubs before coming to Las Vegas where she was a fixture at The Palomino and The Cabaret. Marinka: Marinka “Queen of the Amazons” has worked in burlesque since the 1960s. After studying under the mentorship of Rose La Rose, Marinka went on to perform in in Ann Corio’s This Was Burlesque and the 1979 Bob Fosse film “All That Jazz”, and has performed all over the U.S., Europe and even in the Middle East. Don’t wait, get your tickets NOW! Burlesque Hall of Fame, Inc. is a 501(c)(3) nonprofit. Your donation may be tax deductible (pursuant NRS 598). Please consult with your accountant.